KINGSTON, Pa. – For the eleventh year in a row, the Hourigan, Kluger & Quinn Fund for Children’s Advocacy, also known as HKQ Kids, will give away free bicycle helmets to hundreds of Northeastern Pennsylvania children as part of its ongoing efforts to promote child safety in the region. “Over the past eleven years, our annual helmet giveaway has turned into a wonderful community event," said HKQ spokeswoman Attorney Michelle M. Quinn. “It's so much fun meeting so many children from our area. Our entire firm looks forward to this event every year." The annual event will be held July Fourth from 11a.m. to 6 p.m. during the annual celebration at Kirby Park in Wilkes-Barre. Children are required to be 12 or under, must be present, and accompanied by an adult to receive a helmet. All helmets distributed by HKQ Kids meet U.S. Consumer Product Safety Commission standards, and each helmet comes equipped with a user’s manual and CPSC label of certification. 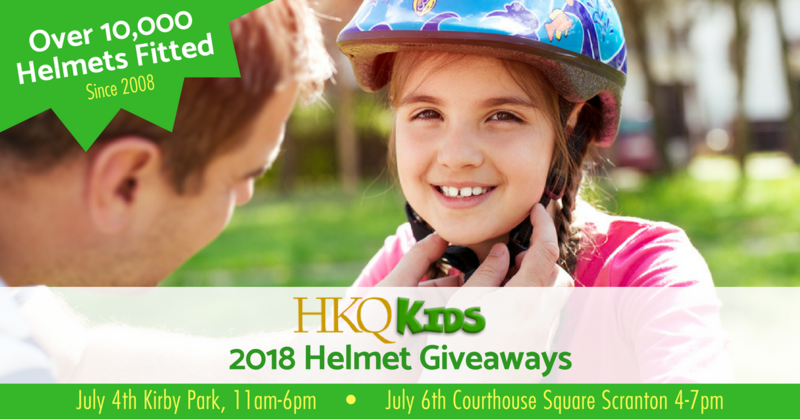 HKQ Kids will be holding an additional Helmet Giveaway during First Friday in Lackawanna County, on July 6th, 4-7pm, Courthouse Square, Scranton. 2017 was the first year that HKQ Kids brought the Helmet Giveaway to Scranton. “We are happy to bring the HKQ Kids Helmet Giveaway to children in Lackawanna County for a second year, and that we are able to extend the helmet giveaway to even more families in our mission of keeping our kids safe,” said Attorney Michelle M. Quinn.